ZD9 is the name of the new high-end TV series from Sony. The 4K HDR TV promises stunning picture quality thanks to X1 Extreme Image Processor and Backlight Master Drive Technology. With the series, the electronics group has succeeded in reaching the top of the highest level. The latest visual experience you can enjoy on your 4K TV is achieved through HDR (High Dynamic Range) content. HDR promises a wide colour variety as well as a great contrast range of bright and deep black image areas. With the new flagship of the Sony brand these promises are taken up. The series surprises positively in its colour and contrast reproduction as well as the detail sharpness of the pictures. This is due to a number of technical achievements on the part of Sony. The is the ZD9 series is available in 65 inches (KD-65ZD9BAEP), 75 inches (KD-75ZD9BAEP) and a remarkable 100 inches (KD-100ZD9BAEP). 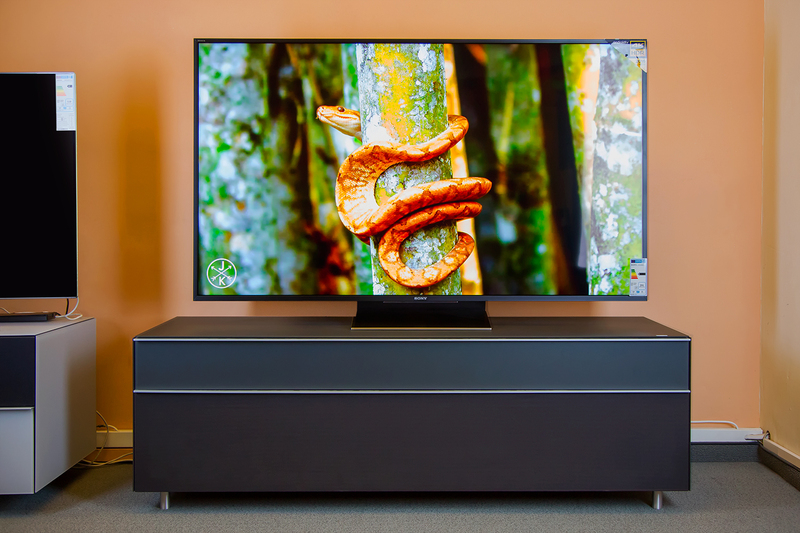 At the heart of the new ZD9 models is the 4K processor called Sony X1 Extreme, which is a further development of the tried and tested X1 processor. The new image enhancement processor works very fast and effectively, resulting in a remarkable image optimization. Sony uses three new technologies to improve image content: HDR remastering, dual database processing, and super-bit mapping 4K HDR. HDR remastering is designed to optimize the contrast and colour reproduction of each scene, which can even be used to calculate SDR (Standard Dynamic Range) signals to match the 4K HDR quality. In addition to the database responsible for upscaling, the processor has a database for noise reduction. The processor recognizes the content of the image, matches it with image patterns, and can improve the details. Thus the Dual Database Processing removes unwanted noise and calculates each image to a sharp 4K image. Super bit mapping, on the other hand, is intended to eliminate colour transitions infinitely and more naturally, and the staircase effect of image contents. This is because the colour blocks are calculated with 8- or 10-bit signal sources to 14-bit colour depth. Thus, the colour gradations are maximized and a more natural image is created, which is particularly advantageous in the reproduction of faces and other subjects with fine colour gradations. In some series, Sony has already used the Slim Backlight Drive. Now this technology has been further developed into the Backlight Master Drive to maximize the full potential of 4K HDR content. The pictures are brilliant thanks to the new background lighting in terms of brightness and contrast. This is possible because Backlight MasterDrive connects a dense LED array with a precise illumination algorithm. Thus, for example lighting zones that hold several LEDs are not individually controlled, but each of the LEDs is individually controlled, thereby focussing the illumination. This ensures a strong divergence of deep black and bright white tones and reduces backlight bleeding, which has so far reduced the full-LED pleasure. 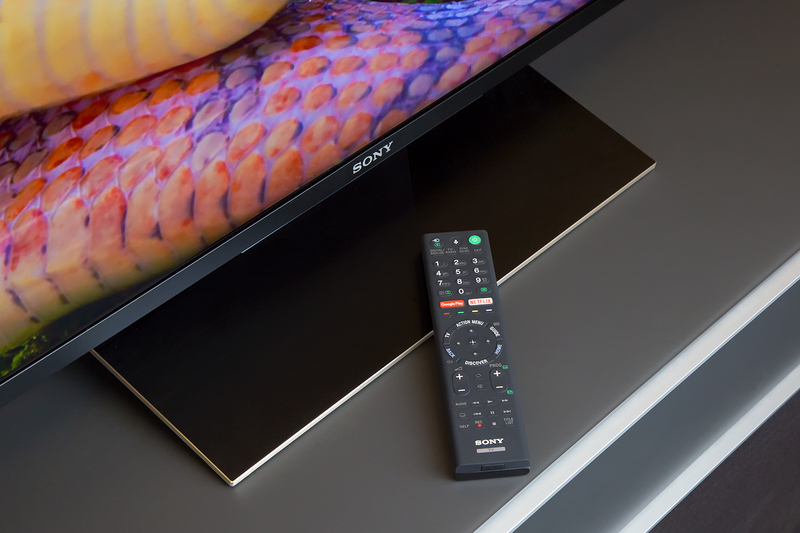 With the ZD9 TVs, Sony attaches to the classic design older series and remains faithful to the recognition value. 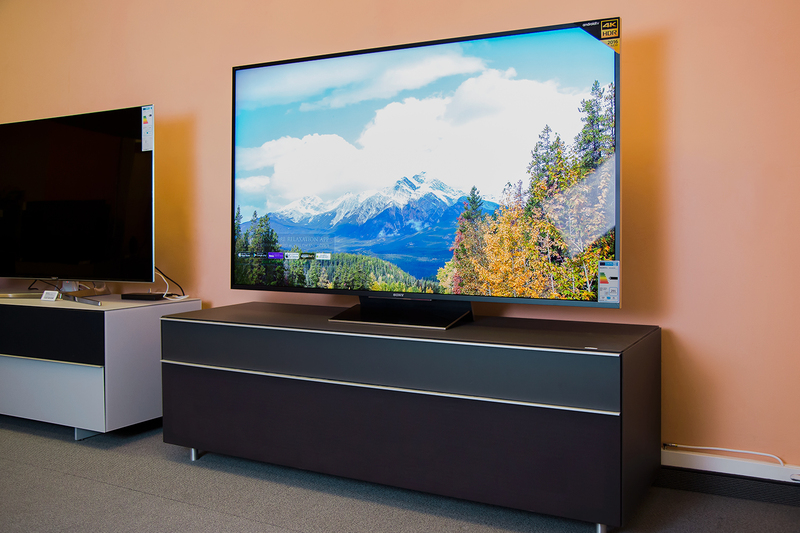 This means that a clear line is traced, in which the frame of the flat screen and the screen itself almost infinitely merge into each other and the cables on the back are gallantly concealed. The same applies to the supplied remote control with the classic structure. Sony has integrated a total of 4 HDMI and a SCART / Composite input, 3 USB connections, a simple triple tuner, a CI + slot, an analogue and a digital audio output as well as an Ethernet socket. In addition, of course, the connection via WLAN is no problem. Also already known from older models is the use of Android TV. After logging in to Google, a wide range of entertainment is provided. For example, the Android interface offers a variety of media libraries, such as ARD or ZDF, and many video-on-demand providers, such as Netflix or Watchever. In addition, games and apps from the Google Play Store are available, and image, video and music content can be transferred via Google Cast to the ZD9 from your smartphone or tablet. The ZD9 models rightly highlight Sony’s technological spearhead. In addition to image enhancement, the motion picture presentation is outstanding. The high-end devices provide brilliant colors and rich contrasts, and even the supported 3D playback works perfectly.